222 pages | 20 B/W Illus. Objects of worship are an aspect of the material dimension of lived religion in South Asia. The omnipresence of these objects and their use is a theme which cuts across the religious traditions in the pluralistic religious culture of the region. Divine power becomes manifest in the objects and for the devotees they may represent power regardless of religious identity. 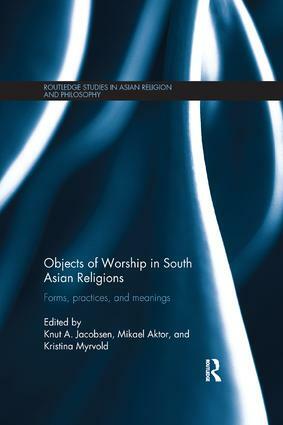 This book looks at how objects of worship dominate the religious landscape of South Asia, and in what ways they are of significance not just from religious perspectives but also for the social life of the region. The contributions to the book show how these objects are shaped by traditions of religious aesthetics and have become conceptual devices woven into webs of religious and social meaning. They demonstrate how the objects have a social relationship with those who use them, sometimes even treated as being alive. The book discusses how devotees relate to such objects in a number of ways, and even if the objects belong to various traditions they may attract people from different communities and can also be contested in various ways. By analysing the specific qualities that make objects eligible for a status and identity as living objects of worship, the book contributes to an understanding of the central significance of these objects in the religious and social life of South Asia. It will be of interest to students and scholars of Religious Studies and South Asian Religion, Culture and Society. Knut A. Jacobsen is Professor in the History of Religions at the University of Bergen, Norway. He is author and editor of around thirty books and numerous articles and is the founding editor in chief of the six volume Brill’s Encyclopedia of Hinduism (2009-2014). Mikael Aktor is Associate Professor of Study of Religions at University of Southern Denmark. His publications include Ritualisation and Segregation: The Untouchability Complex in Indian dharma literature with special reference to Parasarasm?ti and Parasaramadhaviya (2008). Kristina Myrvold is Assistant Professor of Religious Studies at the Department of Cultural Studies, Linnaeus University, Sweden. She has published several articles on Sikh practices in Sweden and in India, and is the editor of publications such as Sikhs Across Borders: Transnational Practices Among European Sikhs (with Knut A. Jacobsen, 2013).